Thank you for considering St. Peter’s UCC for your wedding. This is a joyous occasion and a sacred worship service of the Christian faith. 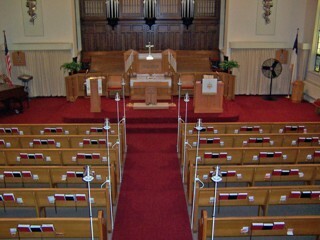 We have two venues; the Sanctuary and the Chapel. Please contact our Wedding coordinator, Hillary Morron, with any questions at 440-988-4965. This is the usual wedding arrangement for the church sanctuary with kneeling bench, candelabras, unity candle holder on the altar, and aisle candles on the pews. Candelabras and aisle candles may be decorated with ribbon, flowers, or vines. 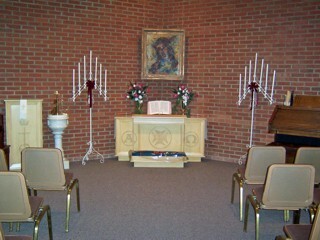 This is the altar with the unity candle holder. It may be decorated with flowers or vines. You must supply your own unity candle. The white tapers are normally supplied. If other colors are desired, you must supply them also. Weddings can also be performed in the Chapel, which can seat a maximum of 30 people. A small organ and piano are available. 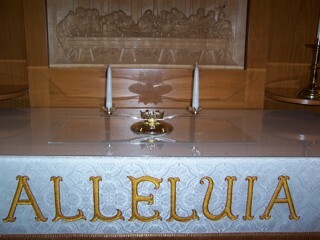 The flowers on the altar are artificial. If you wish to use real flowers, you must also supply your own vases. If you wish to use lighted candles in the candelabras, you must supply them. The wedding ceremony you are planning at St. Peter's is a Christian celebration of love, commitment and thanksgiving. This is a joyous occasion for the wedding party and it is also a sacred worship service of the Christian faith. We will work closely with you as you plan and prepare for your wedding day. Our procedures are straightforward. As you work through this document, you will find answers to many of your questions.